Back in 1978 I had a chance to see Tom Waits in a small venue near the lovely town of Valparaiso, Indiana. I didn’t really know much about him at the time. I went with a friend from work. The reason we went was actually to see the opening act, Leon Redbone. Leon had laryngitis that evening. He never spoke a word. His still did his full show, just everything was instrumental. He would then hold up a little sign that read “Thank You” after each song. He was still enjoyable, but I wish I could have heard the “real” version of Champagne Charlie! After a short delay to change the stage set up, Tom Waits made an appearance. I’ve seen a ton of concerts in my days. After 33 years, I still remember his entrance. He was so memorable and unique that he just burned an everlasting impression into my brain. 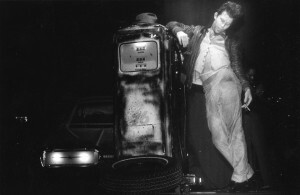 The show began with Tom leaning against a gas pump in what looked like an old abandoned service station. That’s right, not a gas station, but rather , a service station. You kind of remember when you see a Union 76 gas pump on stage. Tom would lean against the pump with his hat over his eyes. You really weren’t sure if it was he until you saw the flame shine on his then, somewhat younger looking face as he lit a cigarette. This is the show that’s will be broadcast this weekend on PBS. Each market is different, so look for yours. I’m not going to miss it. The tour was to support Blue Valentine.